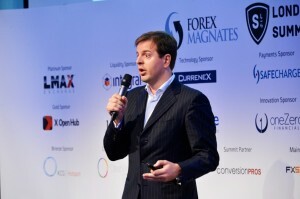 A company that we wrote about several months ago, and that also presented during the Elevator Pitch session at the Forex Magnates London Summit last week, has developed a set of tools through its web interface aimed at helping traders manage risk, while simultaneously ranking them and filtering those with the best risk-adjusted performance. The company is TradeSlide, which under the name Tradeslide Trading Tech Limited, is authorized and regulated by the Financial Conduct Authority (FCA) in the United Kingdom. In reviewing TradeSlide’s business model and structure, we will look at some of the key attributes and end result that the combined suite of tools in this product offering look to achieve. Actually, there are two sides to this, on the one hand, the company aims to attract users looking to become better risk managers and thus potentially more successful traders, while on the other hand, through its application of rigorous ranking of said traders, it aims to offer investors a way to choose from only the best available. 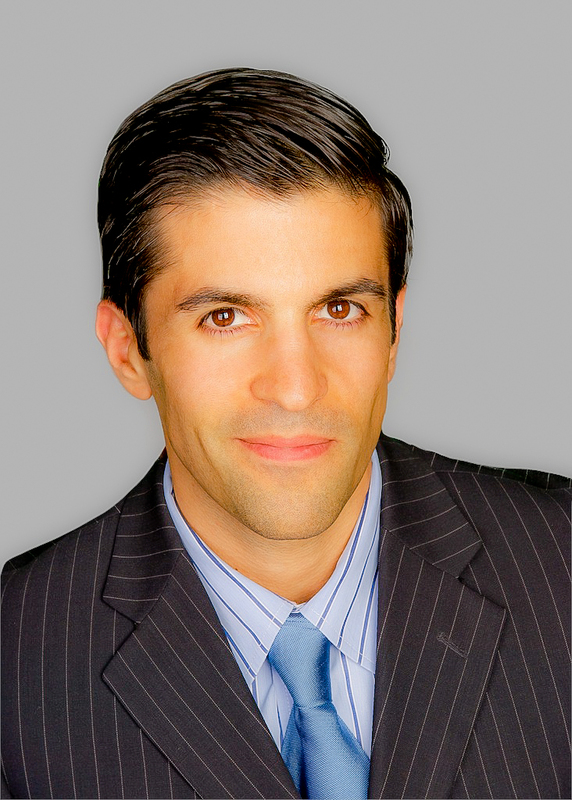 If we consider the premise that on average, one of the difficulties that traders face in structuring a trading methodology, is taking into consideration the number of elements, each of which acts independently as prices progress through space and time, and choosing parameters that reflect individual risk tolerance, investment objectives, suitability and anticipated market expectations. 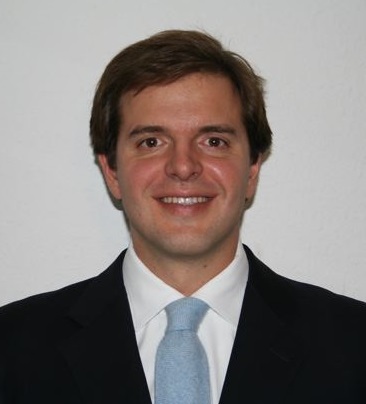 Of these factors, some of the most basic and crucial aspects are the size of a trade relative to an account equity balance, the duration of open positions, the number of simultaneous trades in a given instrument, and the maximum number of open trades across all instruments, at any given time. When taken together, these are the fundamental drivers affecting rate of return, irrespective of the target investment vehicle, assuming normal fluctuations and changes in the rate of the underlying asset classes. 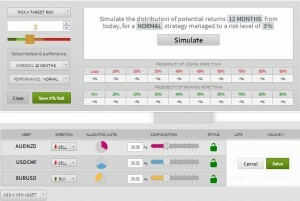 If we add the profit target levels and risk thresholds to each trade, assuming a stop-loss order and limit order have been attached, or taking into account a worst-case drawn down resulting from any unprotected positions, or along with the cumulative stop values as well as the cumulative limit values, then maximum risk and reward across an entire portfolio can be computed. While all of the above may be far easier said than done with regards to trading methodology, and has been the subject of much debate, scholarly discussion and written educational books and learning material, companies like TradeSlide which have the arduous task of extracting meaningful metrics from trader performance –need to go beyond just comparing aggregate returns. Over the last few years, such a need to help clients decipher historical trading performance has become apparent for other aggregators who rank social trading, such as established leaders in the field and recent entrants, several of whom have since made changes to better assist clients. This is no easy task to provide more than just a summary of performance returns, since traders and investors need more than just the Sharp, Sterling, Burke and other sophisticated ratios that the average trader might not be able to meaningfully understand. The task is to translate such risk performance measurements into easy to understand language using either proprietary approaches or easy to understand explanations. Considering the large amounts of data sets ( Traders * Trading History), the results must also be ranked against other traders’ performance rankings, in an efficient and easy to understand method. While each firm may have their own unique approach despite certain commonalities with others, below we can see how TradeSlide approaches the challenge of extracting meaningful data from traders track records. In reviewing TradeSlide’s website, going through the Risk Manager (listed as NEW), the tour of the demo was an interesting experience as the right questions were asked in order to successfully structure a Forex portfolio based on parameters such as those mentioned above, including Value-at-Risk (VaR) thresholds and allocations to different currency pairs, and this is done so in a step-by-step manner in the guided tour. Live accounts that have existing trading history can be synced to analyze prior results and unlock additional functionality of the Risk Manager demo. 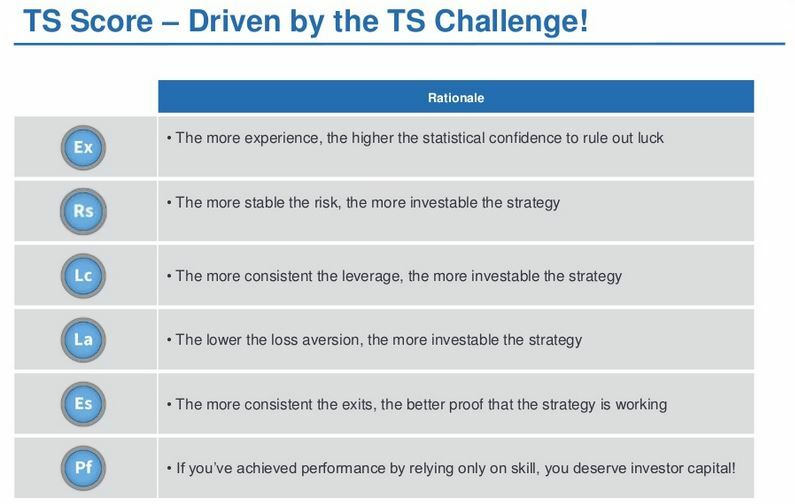 Mr. Colon explained the proprietary ranking algorithm that the firm uses to rank trader’s performance, which results in a TS Score (TradeSlide Score) which can range from 0 (Flop) to 100 (Top), and indicates how investable TradeSlide rates the strategy. Moreover, this includes a two-step approach where risk-adjusted performance is measured (including the level of any unrealized draw-down per trade) as well as a large enough sample reporting period over a given time to rule our mere luck or coincidence of returns, in addition to the above mentioned proprietary ranking algorithm. The service is also presented as a challenge for traders to become more investable and earn one skill per badge, one badge at a time, and using the TS Score as a roadmap. 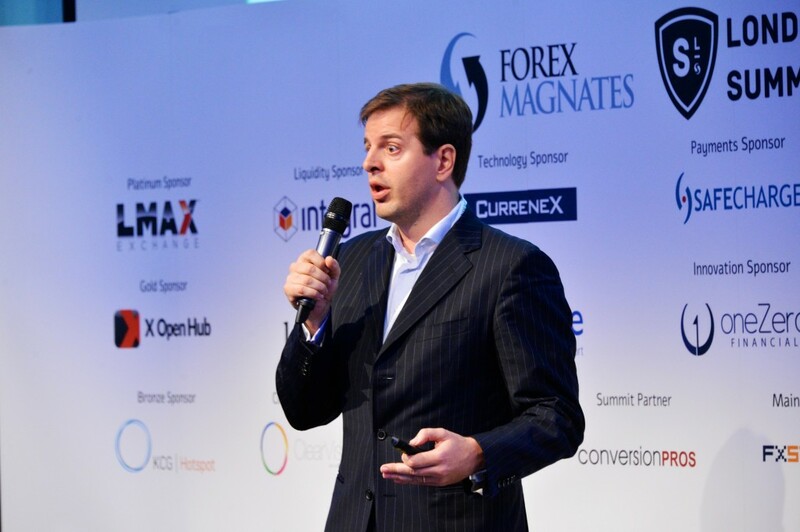 Traders who reach investable status are planned to appear to investors through a separate portal, and utilizing TradeSlide’s regulatory licensing with the UK FCA. While the site is still listed in beta mode, many functions have been deployed, such as an affiliate signup which is presented as a “scouting program”, and enables users to track referrals, a partnership program, a web-browser ad on for chrome,the ability to sign-in with Twitter, and a section to post news and articles and acquire mentorship ratings. In essence, just as some of the previously mentioned providers, TradeSlide effectively creates its own social-network where users can set up profiles with public facing capabilities. Moreover, the tools for traders are presented in a manner to motivate successful progression in the form of education and includes an Investability Report, Trade Journal, and Challenge analysis features so traders can see their progress while pursuing a road towards investabilty. The challenge here, even with a great business model and product, is that it requires traders to join and participate, just like any business, customers are everything. Around the time of publication (of this post), there were at least 33 ranked traders with a TS score of at least 40 or greater, and as per Mr. Colon’s quote, over 4,000 registered users of whom 600 are reporting performance. As discussed above, having already covered aspects of the trader aggregating, ranking and risk-management tools, the other side of TradeSlide’s business is providing investors with the ability to choose from among the best ranked traders who have reached a level deemed “investable”. Once this is achieved, and an investor chooses to allocate a portion of his balance to mirror or copy trades from the Investable Trader. This is comparable to how auto-trading providers select qualifying strategies from a network of traders, and subsequently make such systems available for investors to allocate funds towards social trade copying. Similiar approaches are done with more open and democratic providers that allow almost any trader/signal provider to be copied, while employing a set of emergency risk guidelines to prevent any violation of trading system guidelines. In comparing the track records of traders, whether it’s that of a hedge fund or mutual fund manager, or from a social trading network or signal trading provider, there are several bias that should be considered, such as survivorship bias, back-fill bias, sample selection bias (known as database bias), across various networks or databases that aggregate historical trading performance. Of these, perhaps the one with the greatest risk is self-selection bias, since a traders’ performance could be that of their best account (while not including any other accounts that may contain negative performance into the database, or performance that when taken together would alter that traders’ cumulative ranking), this is known as cherry-picking or selective reporting and something frowned upon by regulators in the context of how money managers present data in their prepared track records and prospectuses. Nonetheless, since there is no one single database that contains the entire history of everyone that has ever traded everywhere (in FX), including their respective performance, such biases as those described above cannot be avoided entirely, and hence the need for sophisticated tools are a necessity (for accurate ranking and analysis).